Cities and towns throughout the country and the world are adopting renewable energy systems to reduce energy costs, taking advantage of the dropping prices in renewable technology. Brittany Patterson and ClimateWire, writing for Scientific American discuss how this will affect the popularity of renewables. Technological innovations have dropped the price of wind and solar in some markets to be not only competitive with traditional fossil fuel power generation, but sometimes less expensive. Georgetown, Texas, is home to the oldest university in the Lone Star State and is affectionately called the “red poppy capital” of Texas. It will soon add another accolade to the mix: the state’s first city-owned utility to run on 100 percent renewable energy. 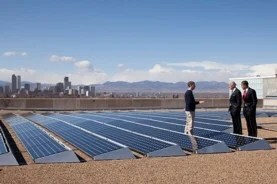 Last Wednesday, the city announced a 25-year contract with SunEdison to buy 150 megawatts of solar energy. In order to supply the power, SunEdison will build a solar farm in West Texas. The solar will complement a deal Georgetown signed last year with EFD Renewables for 144 MW of wind power from its West Texas wind farm through 2039. Between the two sources, the city of about 50,000 people will have more than enough power even with projected population growth, said Keith Hutchinson, a spokesman for the city. When it came down to it, Hutchinson said the price was right for renewable power. Georgetown is the latest city to join the renewables quest, which has been slowly growing across the country. Technological innovations have dropped the price of wind and solar in some markets to be not only competitive with traditional fossil fuel power generation, but sometimes less expensive, said Malcolm Woolf, senior vice president of policy and government affairs for Advanced Energy Economy. In many other places, renewables are gaining ground quickly. Coupled with increased transmission infrastructure, favorable policies, subsidies, and renewable energy goals in states and cities, it’s becoming more common to see wind, solar, hydropower and biomass use. By 2017, more than 13,000 MW of new wind energy capacity is expected to come online in the United States (ClimateWire, March 17). Solar grew 39 percent in 2014, according to the AEE 2015 Market Report. As states consider cutting emissions 30 percent by 2030 under EPA’s Clean Power Plan, renewable energy is increasingly becoming part of the conversation, as well. Texas in particular is experiencing both a wind and solar boom, called a “land rush” by some, in part because of the completion of 3,600 miles of new transmission lines that can bring renewable energy from West Texas where it is being generated to the metropolitan areas in East Texas where it is in demand. The Competitive Renewable Energy Zone, or CREZ, is a $6.8 billion project, paid for by the electric ratepayers of Texas. The transmission project can accommodate 18,500 MW of generating capacity. That move was championed by Republican leadership and the Texas Public Utility Commission and has opened the possibility for renewables as a substantial part of the energy portfolios for multiple cities, said Thomas Edgar, a professor of engineering and chairman of the Department of Chemical Engineering at the University of Texas, Austin. Cheap land prices in West Texas are also helpful, as is a bounty of both wind and sunshine, Edgar said. Texas is a wind leader in the United States, with 20 percent of the country’s total capacity of the resource generated in the state. It produces 12,800 MW of wind power, with wind capable of supplying over a quarter of the grid’s power. Investments have boosted renewable prospects. Last May, Austin Energy announced it will partner with a California company to build a 150-MW solar farm in West Texas to help meet demand in San Antonio, for example. However, the Texas Legislature is debating ending the renewable energy program (EnergyWire, March 18). Also making it possible for cities to consider renewable options more seriously is that engineers have had decades of experience adding renewables to the grid and implementing the technical fixes needed to make them better, said Mike Jacobs, senior energy analyst for the Union of Concerned Scientists. Furthermore, advancements in technology have driven prices down. One of the challenges for cities that want to switch to renewable power is explaining to customers that when the sun doesn’t shine and the wind doesn’t blow, they’ll still be able to turn on their lights. “We realize we have our work cut out for us in explaining what this means,” Hutchinson said. Because Georgetown’s electricity grid is managed by a regional entity, the Electric Reliability Council of Texas (ERCOT), the city is well-positioned for 100 percent renewable electricity, Edgar said. The city calculates its demand for electricity and contracts for the amount of renewables it needs, and ERCOT makes sure supply and demand is taken care of. If there is a surge in demand, ERCOT can send Georgetown electricity, including from coal- or gas-fired plants. But overall, Hutchinson stressed, the city is contracting for more than 100 percent of the energy the city will use in the form of renewable power. It doesn’t really matter whether a city goes the 100 percent route with power purchase agreements or by investing in its own local renewable power sources, Woolf said. San Antonio’s city-owned municipality, CPS Energy, has plans for 400 MW of solar power farms, with more than 45 MW already installed. Even though technology has brought the cost of renewable power down, there are still technical fixes that would make it challenging for larger cities than Georgetown to make the switch. Solar power comes in during the day, while wind blows strongly at night, typically. During peak times, or if demand surges, that can cause problems for the grid, which needs flexibility. Georgetown owns the utility that controls electricity distribution, but the city doesn’t have any generating capacity—it retired its last plant in 1945. Instead, it contracts for electricity. In 2012, the city’s contract with the Lower Colorado River Authority expired and the city began asking for proposals. “SunEdison had the best price,” Hutchinson said. Because nearly all electricity customers are served by the city-owned utility, Georgetown has a fair amount of autonomy to choose renewable energy for its electricity for the entire town, he said. But not all cities have that option. In the case of Windham, N.H., for instance, the city of about 12,000 recently choose a contract to power all of its city buildings on renewable energy. The town selected an eight-month energy contract from Consolidated Edison Inc. that begins April 1. Mark Kovacs, chairman of the Windham Local Energy Committee, which is the entity that solicits bids and makes the suggestion to the Board of Selectmen—which ultimately approves power contracts — said the town went looking for at least 50 percent renewable energy and ultimately decided to pay a small premium for 100 percent renewable power. Ultimately, Kovacs said, because the town does not have a municipal-owned utility—Windham is served by two electricity distribution companies—the best the city can do right now is to choose renewable energy for government buildings if the price is right. Yet, if for price reasons the city decides to go back to “less green” power, that option is slowly incorporating more renewable energy as New Hampshire’s renewable portfolio standard is incrementally increasing. Meanwhile, Tallahassee, Fla., is considering an agreement to add solar to its energy mix though a third-party concept deemed “community solar.” Tallahassee’s electric utility is city-owned, and it also owns three natural-gas-fired plants responsible for the city’s energy generation. To add solar to the mix, the city wants to contract with a third party for a 20-year purchase power agreement. The third-party company currently being solicited by city officials would build a 100-acre, 10-MW solar farm near the North Florida community, as well as any transmission lines needed to connect the farm to the grid. The company would own and manage the farm, and the city would purchase the electricity. The idea was deemed the best way to add renewables to the city’s 99 percent natural-gas-powered generation because the city retains control of the relationship with its 116,000 utility customers. A 30 percent tax credit for the development of solar power set to expire at the end of 2016 also is pushing the project forward. Project developers can take the credit, but city-owned utilities cannot. Other cities have reached 100 percent renewable energy on a citywide basis by a mixture of local generation and power purchase agreements. For one, Burlington, Vt.—a city of 42,000 residents and the largest town in the state—produces more power than it uses from biomass, wind, solar and hydropower. The city-owned utility has invested in and jointly runs some of the renewable energy facilities, such as the McNeil Generating Station, a biomass plant located near the city capable of producing more than 50 MW of power. The Burlington Electric Department is operator and 50 percent owner of the facility. Jacobs, from the Union of Concerned Scientists, said when cities announce they’re choosing 100 percent renewable energy, it gets people’s attention. Plus, he said, if the world wants to get off fossil fuels, states and regions need to see that it can be done at a smaller scale. Janique Goff supports green innovations. Follow her Twitter for more updates on eco-friendly technology. Business Basics: What’s So Important About Going Green?